As a travel writer, event goer, ambassador, and mom, I am on the go just about every day of the week. My fashion is challenging when I travel because often I can only cram so much into one piece of luggage. When my trips are shorter, I prefer to haul less and fashion crisis’s creep up. I heart sweaters but some are so limiting. Plane rides are the biggest challenge. I love being able to find one piece I can wear coming and going and yet staying fresh and fashionable. While you might think it is a tough find, today I will share with you my way of staying fashionable while traveling and how you can too! Hint, hint, it might be a long stylish sweater? Lavishly live travel out loud and see how staying fashionable while traveling is possible even with minimal luggage. The product was provided by Baciano’s. Content is my own, based on my style and always seeking the best of the best for you. My best advice is to find a piece you can wear on the plane both coming and going but the key is what is underneath. After a bit of travel on a plane, I feel stale and there is no way I would repeat clothing unless I had it washed. I want to feel fresh or travel gets old real fast. It’s tough enough being stuck in the small planes and the tight aisles, but comfort must be maintained. For me, travel is about staying warm when the plane is cool and cool when the plane is warm. What that all translate to is a great, long stylish sweater. You already all know me, and you know I am a clothing snob, so I pick and choose my clothing carefully. Fun, fabulous colors, great fabrics, and trends change up the look of the sweaters each year, but choosing from a great collection and designer gives me a classic style that I love. Style, with some dramatic flair, and being comfortable in a long sweater is easy. Do you look at long sweaters and just leave them on the rack? Are you not sure how to style the long sweaters that you see? Styling a long sweater is really easy, In fact, you can wear long stylish sweaters sporty, dressed up or dressed down, it is all up to you! My solution to pulling it together fast are my leggings and jeggins and this fabulous Afton sweater. 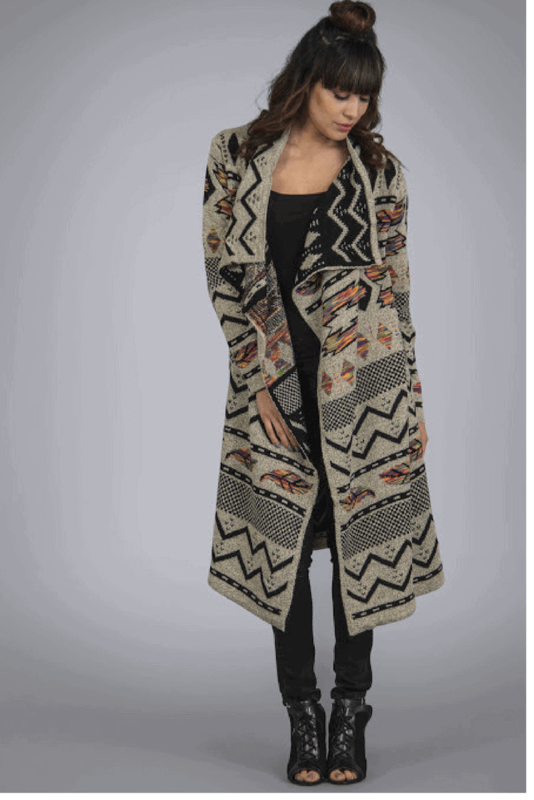 The long beautifully draped cardigan features a pattern that pretty much matches with any color legging I toss on, so it’s 1-2-3- get dressed and drive. The Afton is a standard-fit, comfortable, wrinkle-free sweater so it travels well. You look as good in it at the beginning of the flight as at the end of the flight. Amen! Another side note: the designer sweaters are provided at attainable price points for such high-quality style and fit! Now, here is the secret you just gotta know. Most of us re-wear a pair of jeans at least 2x total, if not more (please I see the droopy, stretched out seats, on the denim, it’s a dead giveaway). Use this jean tip to get the secret to traveling. Pick your pair of jeans, match it with comfy neutral shoes, ( I heart booties and classic loafers for the sake of flying). Choose a shirt you love but you are so not limited to color, look at the fabulous pallet on the Baciano Afton sweater. Now, pick again, another shirt for the way back. Wear the same jeans, the same sweater, but freshen your shirt and undergarments and packing just became that much easier. P.S. – just in case you prefer leggings you can wear these too, I just prefer jeans for the plane seats. Now you know my secret to travel. Stay fashionable and comfortable while traveling, while sporting a great look. It’s all about Staying Fashionable While Traveling! Everybody should be comfortable by styling. The sweater you wearing was so attractive! Nice post! Everyone wants to look trendy and glamorous. It’s just that you need to understand what will look cool on you. Once you got to know your style, you will automatically pick the accurate style for you. For a trendy traveling look, fashion clothes for women are the best pick for you. So grab them for a cool traveling look.